According to the ancient manuscripts, a good father can do the following... ‘He raises us, instructs, tells us off, has foresight, has a good heart, protects, is compassionate, is concerned, educates... he places before them [children] a large mirror, a mirror pierced on both sides: he is a large torch that does not smoke... so they may come to know themselves, to become masters of themselves’ (Codex Matritense, VI, Part 11, fol. 199). 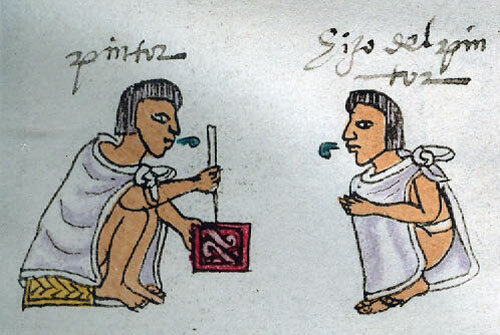 According to 16th century Mexican manuscripts, the Aztecs believed parental guidance strengthened the faces (ixtli) and the hearts (yollotli) of their children by making them aware of their nation’s social order and code of ethics. At a certain point in their youths, children were sent to schools where they were put in the care of wise men (tlamatinime) and warriors, who “sought by education to endow the face with wisdom and the heart with strength” (León Portilla, p145). The ancient books of the Aztecs don’t seem to agree when children went to school; some say that they did so as soon as they could walk. Others state that they entered at the age of fifteen! 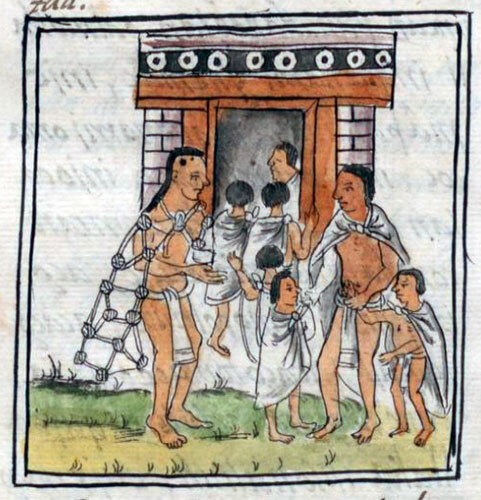 In this image from the Codex Mendoza (pic 3), a father hands his son over to the men responsible for the rest of his education. They are representatives of different schools: the Calmecac (upper right), a temple school attended by young nobles, and the Telpochcalli (lower right) which was dedicated to most commoners. The man sitting outside the Calmecac is a priest, and next to the Telpochcalli underneath is a warrior. They are both sitting on mats (petlatl), which is a symbol of their authority. 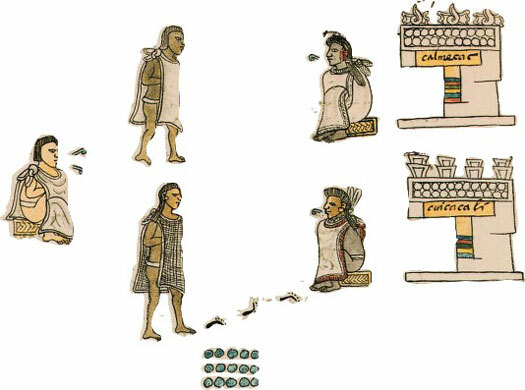 Calmecacs and Telpochcaltin were responsible for facilitating young people’s interaction with legal, military, and religious aspects of Aztec life. Calmecacs also gave their students the opportunity to learn intellectual subjects such as art, astronomy, astrology, genealogy and history. Of most importance, however, was a task that parents and schools shared equally: the teaching of strength and self-control, the fundamental aspects that underpinned a person’s character. Nurturing a young person’s character was of utmost importance! At school, pupils learned from wise men called tlamatinime. They have been described as philosophers although their name literally means ‘those who know something’. Tlamatinime mainly taught in Calmecacs and had different skills that they could hand over to their pupils. They were entrusted with ‘bringing them up’ by helping them to develop courage, self-awareness and restraint through tasks such as fasting and performing religious rituals. Additionally, they were charged with encouraging ‘wisdom’ in young people by training them intellectually and helping them to understand the value of morals and humility above and beyond material comforts. The religious temple - school of the nobles, or pipiltin, is often thought of as a place reserved exclusively for the upper class. However, any father could send his child to this house. He only had to do so by dedicating him to Quetzalcoatl! The Aztec deity, Quetzalcoatl (pic 6) was the patron of fine arts, writing and astrology. Calmécacs were built in his honour and as part of his legacy as the Toltec sage and priest, Ce Acatl Topiltzin Quetzalcoatl. Needless to say, this was the school where one learned to be a priest and intellectual. Mainly reserved for children of the elite (pipltin) (pic 7), there is evidence that commoners (macehuatlin) and the children of merchants (pochtecas, an intermediary class between pipiltin and macehualtin) also attended. Some scholars go so far as to say that while different social classes tended to educate their children separately, any child who was offered to Quetzalcoatl would join the Calmecac. 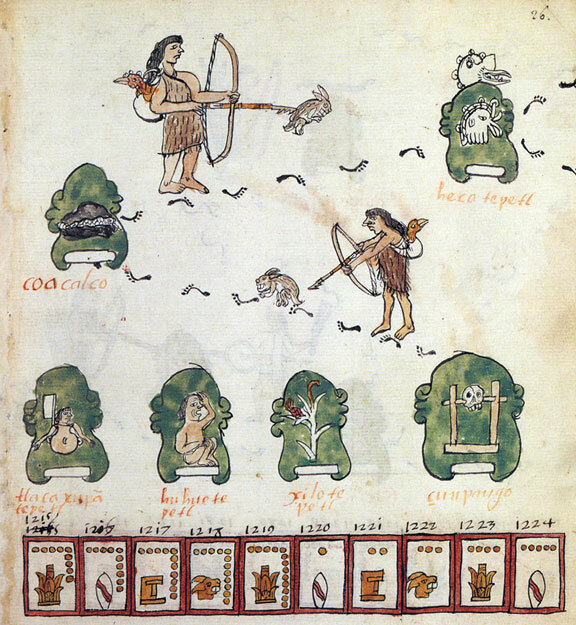 This image from a page of the Codex Mendoza shows young men from the Calmecac performing duties to support their temple: sweeping (a sacred activity), as well as carrying foliage, maguey spikes and fence-making equipment. They paint their faces and bodies black in commitment to their Calmecac training. Who said that life was easy? In the Calmecac, young Aztecs knew that strength and self-control could only be learned through some amount of hardship! By the time they went to school, they had already experienced hunger as their food was strictly rationed by their parents. At school, this type of austerity continued and children learned to discipline themselves by waking at night to perform religious rituals of self-sacrifice, where they pierced themselves with maguey (cactus) spikes. To be able to control one’s actions was a highly prized trait. After all, the Aztecs had had to deal with years of hunger and difficulty as nomads before they settled in the city of Tenochtitlan. Only their toughest, most disciplined descendants could have survived such a gruelling experience (pic 8). 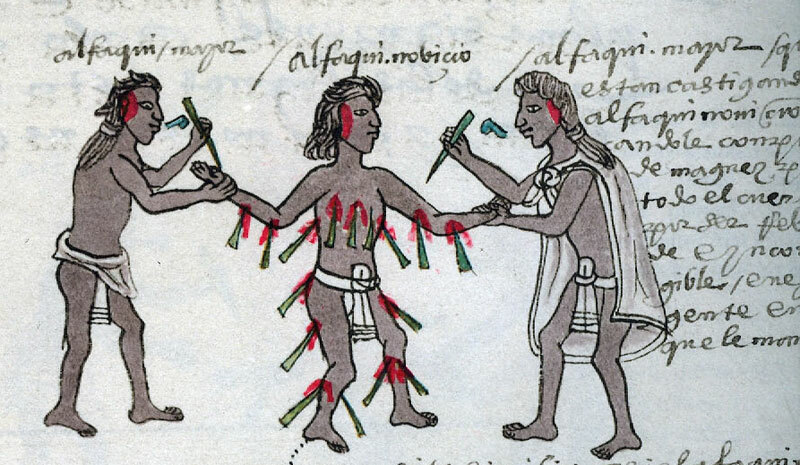 Showing restraint was an Aztec’s chance to learn from and honour the actions of his ancestors. 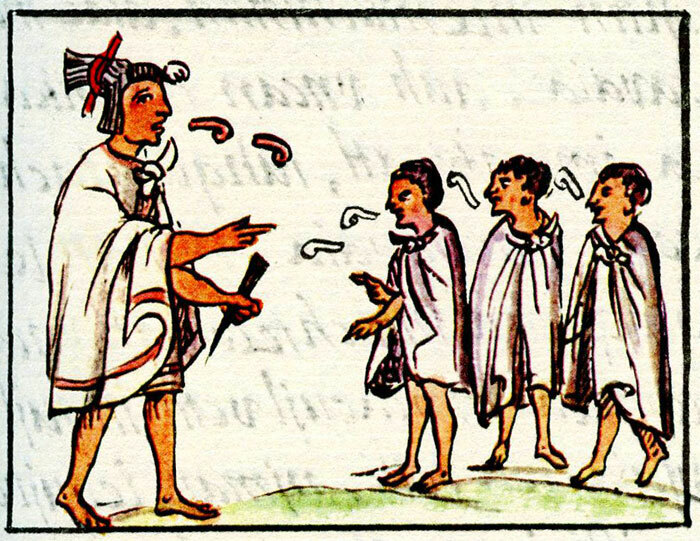 At the Calmecac, Aztecs were instructed in the art of language. Called tecpillatlatolli, or Lordly Language, this would have been like our equivalent of the Queen’s English. Dignitaries and lords would use this ‘high’ form of Nahuatl to address audiences or perform religious ceremonies. 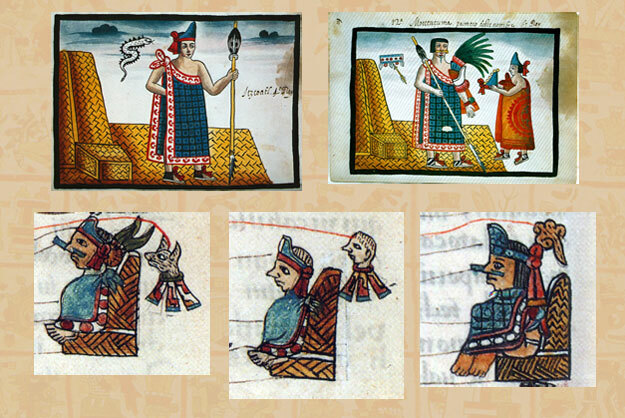 Equally important were sacred songs (teocuicame) and Flower-and-Song speech (in xochitl in cuicatl), akin to poetry, as they were forms of telling the history and myths that were recorded in special books and memorised by wise men (tlamatinime). Religious knowledge was also written down in books, and youths had to master the astronomy of the lunar and solar calendars, as well as their accompanying astrological significance. 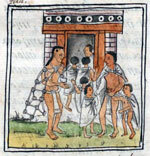 For example, this image from the Codex Mendoza (pic 10) is dedicated to some of the tasks taught by high priests to the youths of the Calmecac. The third priest (to the far right) is studying the night sky. The accompanying gloss says “Head priest who is looking at the stars in the night sky to ascertain the time for services and duties.” (Berdan and Anawalt, 1992, Vol II, p.177). A young priest-in-training can be seen on the far left of the image. Pix 11 and 12 depict another intellectual pursuit: writing. History, religion, mythology, songs and poetry were all recorded in books. Writing or painting books was considered a great privilege that could only be held by highly educated people. The picture on the left is of a female scribe (tlacuilo). The gloss next to her says la pintora, or, ‘the painter’. All this education might seem like too much hard work, but let us for a moment remember why it was taught. Earlier we saw how a father must place a mirror before his child so that he or she could look into it and know themselves. At the Calmecac, demanding lessons were carried out for the same purpose: ‘...to make wise the countenances of others’. In other words, the tlamatinime helped their pupils to know themselves, to develop ‘wisdom’. Education was ‘the act of giving wisdom to the face’ (neixtlamachiliztli). 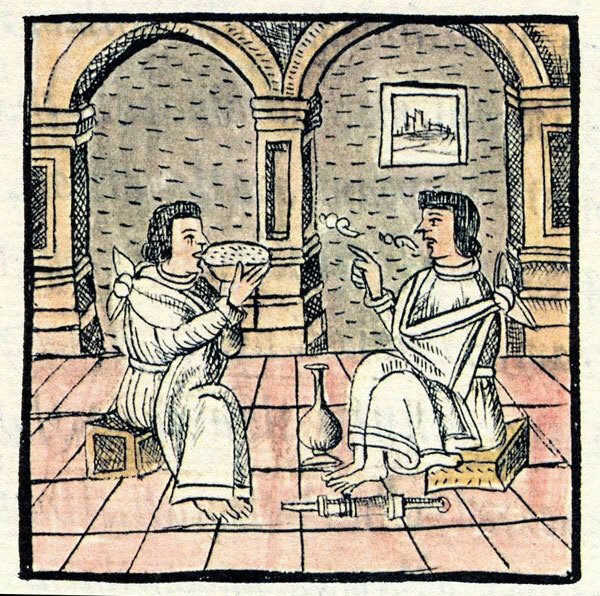 Wisdom was the highest, loftiest goal of tlacahuapahualiztli and neixtlamachiliztli (‘The art of bringing up or strengthening men’, and ‘The act of giving wisdom to the face’), and is seen by scholars to be a humanistic ideal of the Aztecs, or in other words, a belief in men and women’s capacity to achieve dignity and fulfilment through their own acts. According to Aztec philosophy, this could only be achieved through purity of heart. An example of the Aztecs’ respect for wisdom can be found in the role of their two highest priests. Named after the wise god, Quetzalcoatl, these top-ranking religious men could be from the poorest background so long as they displayed great purity of heart (León Portilla, p145). teotl yiollo He has god in his heart. The children of commoners (macehualtin) tended to be educated in telpochcalitin, schools that were more numerous than Calmecacs and were present in every neighbourhood (calpulli). A little more relaxed in their educational style, telpochcalitin still served to instill wisdom and strength in their pupils. By completing building and agricultural activities for the community, young men were taught to respect the authority of military, legal and religious institutions. They also kept temples’ sacred fires burning by giving them wood, memorised songs (cuicame) in special houses dedicated to this (cuicacaltin) and received training in the art of war. When a father sent his son to the Telpochcalli, he dedicated him to a different god to that of the Calmecac: Tezcatlipoca. Omnipresent and all-powerful, Tezcatlipoca was known as a great creator and destroyer. 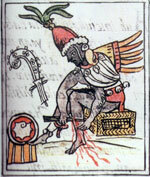 He represented the Telpochcalli in two guises: as a warrior (Tezcatlipoca Yaotl) and as a youth (Tezcatlipoca Telpoch). 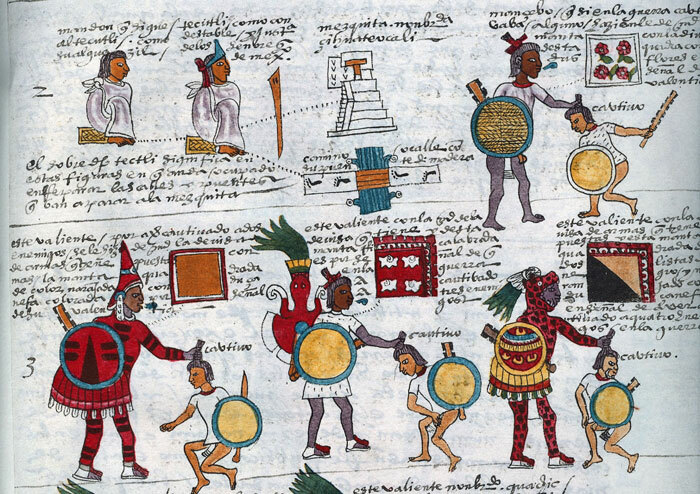 The concept of war lay at the heart of Aztec religion and politics, and every young attendant of the Telpochcalli learned from seasoned fighters how to wield weapons. 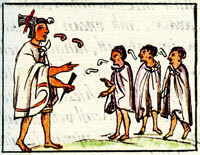 Youths had the chance to rise in rank and fame by serving the Aztec empire on the battlefield, and the schools’ teachers encouraged them to be stout of heart. Plenty of training and practice would have gone into preparation for war, and so we see that self-control and discipline were also important for members of the Telpochcalli. Additional tasks would have included religious rituals of penance as well as austerity at the hands of their teachers. 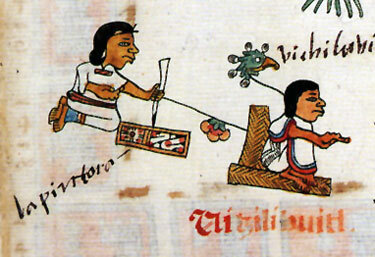 In this fragment from the Codex Mendoza (pic 16) are two important duties of Telpochcalli youths. On the left (top row), a lord oversees communal works to a temple. He is linked by a dotted line to a ‘coa’, a tool used for labour. On the right (top row), a youth takes his first captive and is awarded the special emblem for this: a blanket embroidered with flowers. Beneath him are further ranks a young warrior could achieve. Each blanket, a folded square to the right of each warrior, shows their military status. Who could Aztec youths look up to? Itzcóatl (Obsidian Serpent, fourth Aztec ruler 1427-1440). A brave leader, Itzcóatl freed the Aztecs from the Tepanecs who until then had dominated the Valley of Mexico. This made the Aztecs able to found the basis of their empire! Tlacaélel (1397-1487) Wise and intellligent, Tlacaélel was first advisor (Cihuacóatl) to four Aztec rulers and is known for his influence in shaping Aztec cultural identity. Motecuhzoma I (fifth Aztec ruler 1398-1469) A warrior and strategist, Motecuhzoma I managed to consolidate his empire and then went on to conquer many new lands. Cuitláhuac (1476-1520) Leading the Aztecs in a magnificent attack against the Spanish, Cuiltahuac expelled them from Tenochtitlan for a brief period. Cuitláhuac died of smallpox after 80 days as leader. Nezahualcoyotl (1402-1472) Known as a great poet, judge and leader, he and Motecuhzoma I devised an aqueduct that brought fresh water to the city of Tenochtitlan. 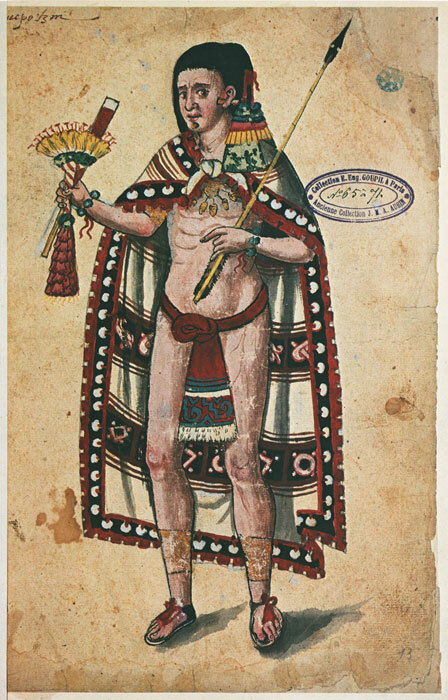 Nezahualpilli (1464-1515) Son of Nezahualcoyotl, Nezahualpilli was known as a sage, a wise and just ruler and keen astronomer. 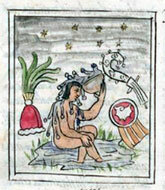 Huehuetlatolli, Document A (León Portilla, p145). León Portilla (p146) interprets these words as indicating that a person should be taught how to live so that they can find their heart, their ‘self’. Also, they must learn how to respect authority and those around them, demonstrating a straight and appropriate attitude and avoiding indulgence and deviousness. 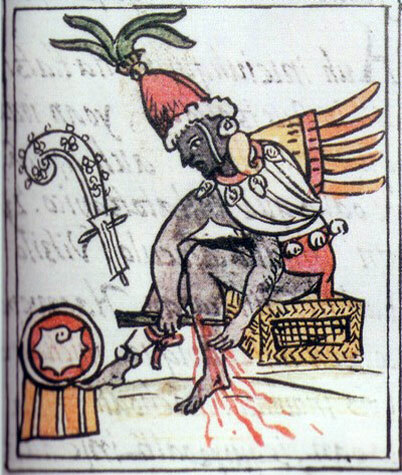 According to the Huehuetlatolli (a group of books that based on the words of Aztec tlamatinime that survived the conquest), there were certain righteous acts a youth could do to consolidate his learning and achieve the task of finding his face and his heart. Can you think of any modern day equivalents? We’d love to hear them! you shall have drink, food, clothing. with this you shall stand straight. with this you shall live. in this manner you will show yourself to your parents and relatives. Someday you shall tie yourself to a skirt-and-a-blouse*. What will she drink? What will she eat? Is she going to live off the air? 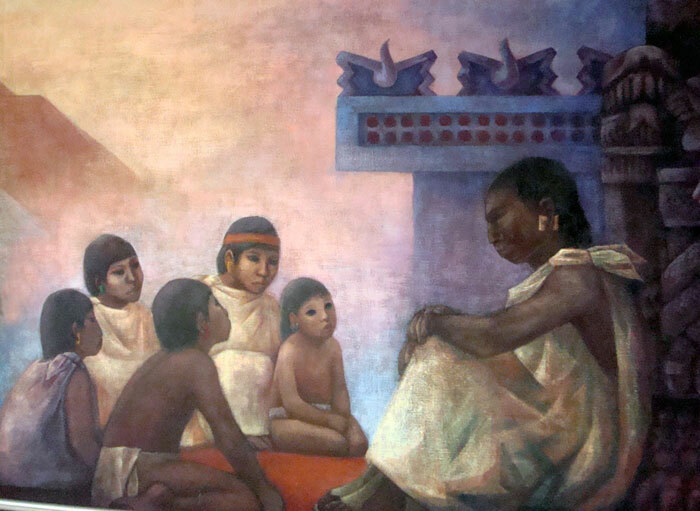 Throughout this article we have seen what the main aims of Aztec education were, who taught the philosophical foundation of this process and what it was that the youths learned. Calmecacs and Telpochcaltin introduced young people to the state’s institutions and commanded that they respect and obey its administrators. It was recorded by the sixteenth century Jesuit, José de Acosta, that the Aztec education system was so good that it should be used by the Spanish to introduce young people to Catholicism (Acosta, p.374). Friar Bernadino de Sahagún went on to express how the order and discipline imposed in Aztec schools were so impressive that after the conquest of Mexico in 1521, the destruction of Aztec educational philosophy at the hands of the Spanish left youths without respect for the new colonial system. 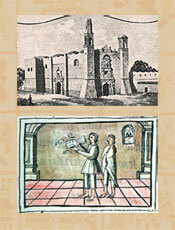 The image to the right (pic 20) is a picture of the first educational institution founded after the conquest. Its name was Colegio de la Santa Cruz and was made of stones from the greatest of the Aztec pyramids, nowadays called the Templo Mayor. 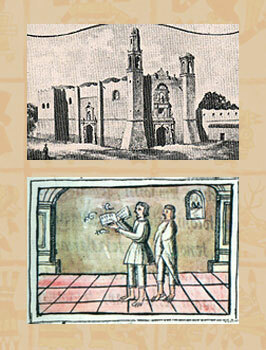 The Colegio was founded in 1536 and was used by Nahuas (Aztecs) of noble descent. • Acosta, José de. Natural and Moral History of the Indies. USA: Duke University Press, 2002. • Berdan, Frances and Anawalt, Patricia Rieff. The Codex Mendoza. Berkeley: University of California Press, 1992. • León Portilla, Miguel. Aztec thought and culture. Trans. Jack Emory Davis. USA: University of Oklahoma Press, 1963. • López Austin, Alfredo. Cuerpo humano e ideología. Mexico D.F. : UNAM, 2004. • Sahagún, Fray Bernadino de. Historia general de las cosas de Nueva España. Prologue by Angel María Garibay, 6th edition. Mexico, D.F. : Editorial Porrúa, 1985. • Soustelle, Jacques, The daily life of the Aztecs on the eve of the Spanish conquest. London: Phoenix Press, 2002. 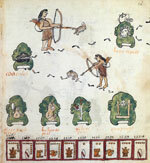 Codex Ixtlilxochitl, Codex Mendoza, Codex Telleriano Remensis, Codex Tudela, Florentine Codex, Primeros Memoriales. • Most codex pictures now in public domain.